I previously mentioned my studies as an MA student doing translation at SOAS in London. The biggest disappointment has been the lack of vocational information, in other words, useful information for working in the real world, such as with Japanese translation agencies (or agencies in general). There is a large focus on the academic side when 95% of the students are unlikely to become academics. I attended a free Q&A recently with a translation agency in London (who dealt with a variety of languages) who are finding it hard to get good translators. Their Q&A sessions was a way to improve the quality of translators, but more importantly, their relationship with agencies, by talking to beginners translators who don’t know what they’re doing. The following is the advice they gave which might help you gain work and build good relationships when going out into the world as a freelance translator. A translation agency is a company that is hired by other companies to translate work, they then contact the translators they feel would be most appropriate for the work from their database and contract them to conduct the translation. A translation manager within the company will not only liaison between client and translator, but also do marketing, administration, hiring, etc., and sometimes some translation work themselves. Another issue is scammers who will copy real translators CVs off the internet, and when they get work, send the translation to China or India for a cheap, quick and low quality translation. Meaning they do not work but reap the profits. Due to these reasons it is difficult for an agency to find the time to work through all the e-mails and vet out fraudsters compared to real translators. As a result many emailed applications will get ignored. One key advice given was that you should try and make a personal connection with an agency, rather than e-mailing them. As mentioned, lots of emails and the risk of fraudsters means if you e-mail an agency there is a risk of you never hearing back from them. Go in person or call them to arrange a meeting to discuss possible work. Try going to events where you can network and make a personal connection. Having accreditation (certified proof) of your ability to translate is also highly desired (due to low quality beginners, and fraudsters). This means getting a degree or working with an association to earn a translation certificate. You can look up associations for these but in the UK there’s the Institute of Translation and Interpretation, and in the US is American Translators Association. Try and have a few specialist subjects. These can be in areas you work well in, enjoy and/or are interested in. It’s hard to know what your speciality is as a beginner if you haven’t worked with translation much. But it helps to focus on what you’re interested in and inform agencies, when you talk to them, the areas you wish to work in. (I’ve previously discussed specialisations in Getting Translation Experience I). Flexibility is important. Some translators don’t like working out of hours (after 5/6pm and at the weekends), but if you have flexibility and are willing to work during the times others aren’t then you’ll have an edge. You can also charge extra for out of hours work, although as a beginner you might want to charge a lower rate, which will make you more desirable. More experienced translators will charge a minimum fee for a job to avoid doing small jobs that won’t pay much. As a beginner translator it’s these jobs that you can take advantage of. Offering a lower minimum rate and specifically requesting smaller jobs will also help you receive work which you can use to build experience. Typing speed and words an hour can be useful. It’s not necessary but let agencies know you typing speed and average words an hour can be useful knowledge for them to have. Agency’s expect a certain standard. Sloppy does not get repeat business. It’s common sense really, but a pitfall many (including myself) fall into. Agencies will proofread work, but they don’t want to have to proofread something that hasn’t been proofread already. Once you’ve finished a translation don’t be in a rush to send it off right away. Take the time to read it, then give it to someone else to read through. This can be a friend, partner, or even professional proofreader. You don’t need to be able to afford a high quality proofreader, it could be a student of English or a newbie in the proofreading world who needs the experience, just like you need the translation experience as a beginner. Sometimes translators will even team up to check each other’s work. Another point it that an agency will expect at least 2000 words from a translator in an 8 hour day. The best translators in their specific fields can get up to 10,000 words done. People with higher experience and more speed will often charge less per hour for this reason, as they can make up the pay by getting jobs done faster. Never assume, always check! This links to the above about not being sloppy, but it’s not just a matter of grammar. When translating you might find yourself thinking “I’m pretty sure this means this” but you’re probably wrong!! Even experienced translators will double check something when they come across something they’re not 100% sure of. And even if you’re 100% sure on something it can’t hurt to check! Communication is key. Being easily reachable is very useful to an agency. If you know you’re not going to be near your email then set up an out-of-office automated response. If you can’t get a job done after you’ve accepted it let the agency know right away!!! Leaving it to the last say before the deadline puts the agency in a bind because they need to find someone to finish the job right away. Not only that but it makes you look bad and you’ll unlikely get repeat business. Everyone is human and errors can happen, so being honest about your situation is the best thing you can do for yourself and the people you work with. Get some translation software. 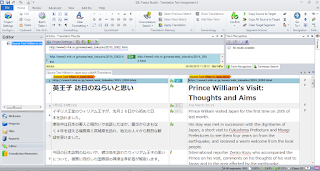 It’s worth investing in some translation software, although it doesn’t have to be as expensive as trados right away, and you can even get some software for free! Proz.com has good information on the most popular translation softwares. There are also guides online on how to use them if you don’t already know. Investing the time and money in them right away will help you a lot in the long run! Make sure you eat well, get exercise, and human interaction. 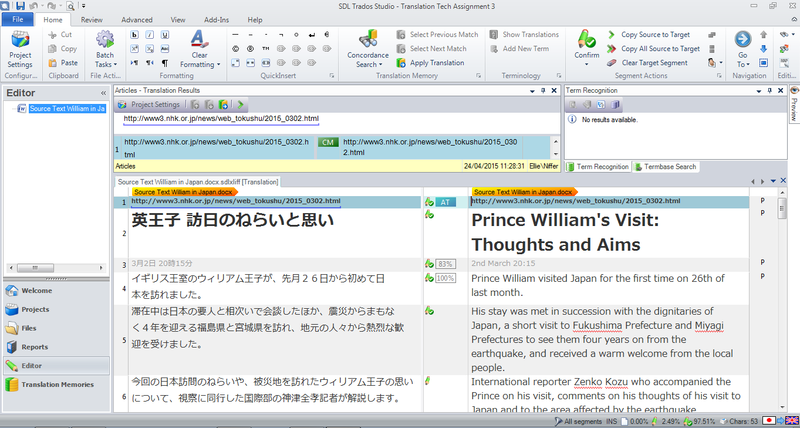 Freelance translation means a lot of time spent indoors on your computer. As a result translators can easily get depression and health problems from sitting down all day. It’s important to take care of yourself (someone suggested standing up for at least 3hrs a day with a taller desk, and cardio exercise at least 3 times a week). Regular human interaction is also crucial to stop yourself going crazy. So make time to meet up with friends or even other translators!